One of the integral pieces to working with astrology is the concept of orbits. All planets revolve around the Sun (minus the Moon, which revolves around Earth), and those with a greater distance from the Sun have a longer orbit. The length of the orbit dictates how long it will take for us (on Earth) to complete the planet's story. This visual speaks to both the phases of the Moon as well as the standard planetary orbit, as they are the same. Beyond the circle (really it's an elliptic, but whatever) the key thing to focus on is the red cross that divides the circle into quadrants. This imaginary cross creates key points within the circle, which in life, become test points or critical events/experiences that help us flesh out the matter/challenge. The Conjunction (New Moon, or 0°) would be the starting point. That point on any chart is always crucial as it explains the chart's Rising point, or Ascendant. It's where the Sun rises in the chart. 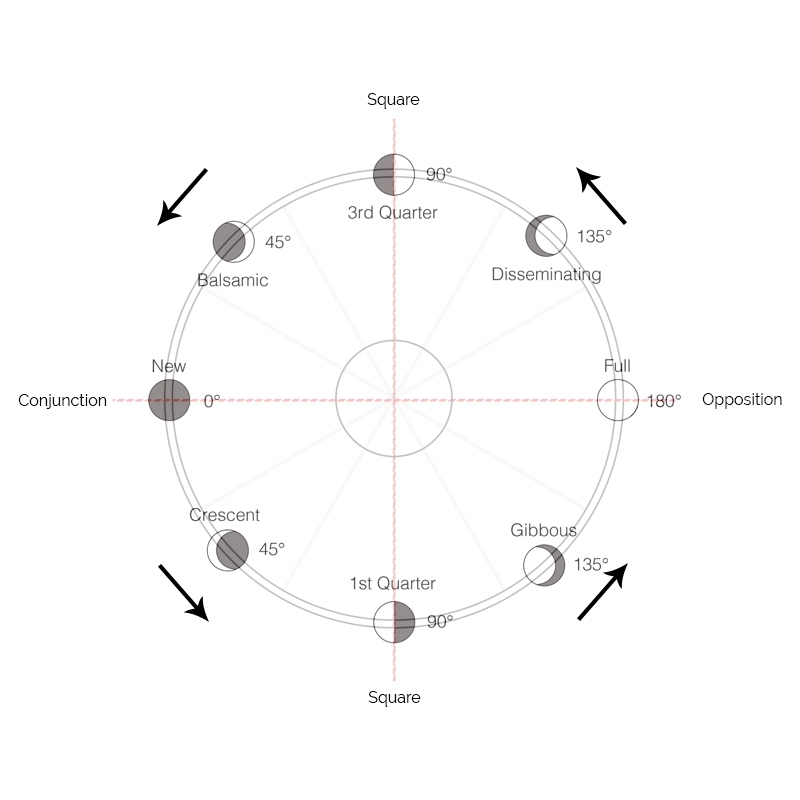 A planet continues along its orbit in a counter-clockwise fashion until it reaches the Square (1st Quarter, or 90°) to its original starting point. Here's where we see the first challenge or experience which asks us to stabilize the situation. It will continue on again until it reaches its next critical point, the Opposition (Full Moon, or 180°). Here we see an externalizing of the situation/story, or a bringing in of other partners/people. It also may bring about some form of completion within the story. It's far from totally over though! In fact, it's only really half-way through its whole cycle. Much like before, it will continue on further until it reaches the next major point, which is the final Square (3rd Quarter, or 90°). This is another experience/test that asks us to externalize the story and pass it on to everyone else for benefit or growth. This same idea may have come about in the opposition point, but this will bring about more recognition on the matter. This is the highest point in the story where we usually see the most attention. Finally the cycle continues on to close out its story as it approaches the Conjunction (0°) point and looks to start the cycle all over again, but with enriched knowledge and growth from the previous cycle. Approximate Orbital Length is the length of time it takes for the planet to complete a full cycle around the Sun. Average Time in Sign is roughly how long each planet resides in each sign (Aries - Pisces) as it passes through the zodiac. Approximate Opposition is half the length of the planet's orbit. To find the approximate time for a square divide this number in half.